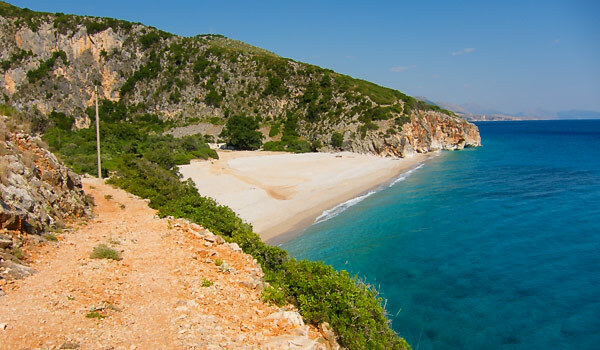 An hour’s stroll through the picturesque Gjipe canyon in the Albanian Riviera and we should reach the Gjipe beach on the Ionian sea – that’s what I was assured of by my sweetheart. Hoping for such a quick reward, just after we parked our car in the bay by the road leading from Dhermi to Himara, I eagerly packed some food, water and sun cream and we hit the road or rather the canyon or rather it hit us as we realised later. At the beginning this is a nice stroll, really. 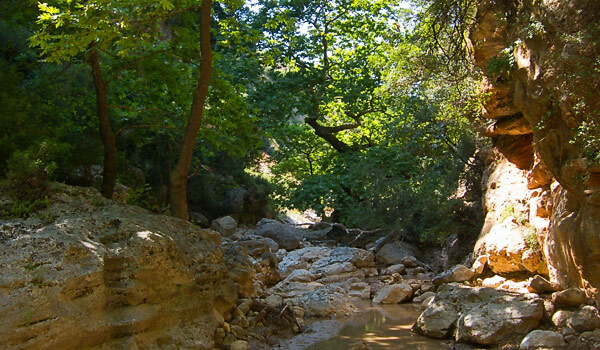 The canyon is not very deep but overgrown with bushes and covered with pebbles but as we walked it became deeper and narrower. The trees are like in a fairy tale dream with their thick branches bathed in sunbeams. So quiet, only birds singing, a murmuring brook and cicadas…and us, of course. So as we walked, the canyon got deeper and darker. The pebbles turned into stones, then rocks and the brook slowly became a small waterfall. More and more often we had to walk on all fours and as we were not prepared for a climbing expedition we had to slip down from the rocks or even jump. One hour later – I must mention that by now I should have been lying on the Gjipe beach for at least half an hour – surprisingly not a beach, but a steep cliff presented itself before our eyes – very steep actually, and about 5 meters high, so we could either jump or…die or turn back so we….retreated, and this time it was not only my decision. Anyway, as a consolation price we spent the rest of the day, or rather the evening on one of the beaches in Dhermi. Just so you know – we finally reached the beautiful Gjipe beach three days later, when we were visiting the ruins of St Theodor’s Monastery. This time, no jumping or slipping down off the rocks, really we just walked down the old stony road and we saw the exit from the yet to be reached Gjipe canyon. We reached the beautiful Gjipe beach a few days later via a coastal stony road. We returned to the Gjipe canyon 3 months later, in a group of four this time, equipped with a 10 metre rope, a few quickdraws and a piece of string. For our two friends who had already climbed Kilimanjaro and spent almost two months in the Himalayas this was just a stroll. The whole trip through the canyon took us 6 hours. We reached the Gjipe beach at 8pm, then as a well-deserved reward we had a swim in the sea in complete darkness, licking the wounds and scratches sustained while crossing the canyon – but it was well worth it (we still had to walk for another hour to return to the car). This is an excellent opportunity to see the wild side of the Albanian Riviera and experience something out of the ordinary. Be warned though, this is an unmarked walk, almost nobody knows about it, so if you get stuck or get hurt on the way, there is little chance of help; you are responsible for your own safety there. This walk is very demanding physically and recommended only for the more adventurous type of tourists or climbers – and not recommended for a single person alone. You should allow a whole day for this trip – due to our inexperience in rock climbing and inadequote equipment, it took us originally 6 hrs to cross it the first time. This trip can be combined with an overnight stay on the idyllic Gjipe beach and a visit to the ruins of St Theodor’s Monastery. 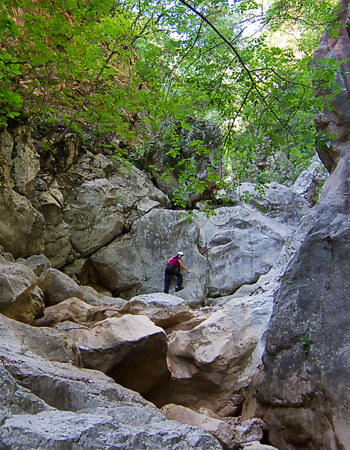 The return leg via the canyon is impossible in the opposite direction unless you leave the ropes for yourself hanging from the rocks while climbing down or if you are an experienced climber and don’t need any equipment to climb 5 metre high vertical rock. Length of the walk through the Gjipe canyon (red line): 2,5km – stony and rocky path, partially very steep and dangerous. Can be slippery during wet weather or rainy season. Climbing necessary in a few places. Time required: 3-5hrs down through the canyon, depending on skills and equipment. Allow at least 1hr for return leg (see below). Things to take: ropes, cords and webbing equipment. Food, light source, plenty of water. Return leg to reach your car (blue line): 4,5km uphill but easy walk, first along a stony road (1,5km) and then an asphalt road (3km). 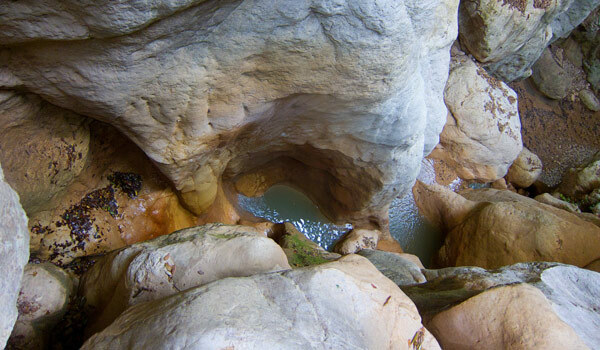 Do you have any other informations about unexplored canyons in Albania? We wont to come on this year in your country for exploring canyons.